Do you ever wonder what actually happens to clothes you donate? Where they end up – and who wears them? Well, I’m in Greece, on the island of Samos working with Samos Volunteers for a month, and can testify about what happens to the donated items we receive here, and who receives them. We are working with refugees from Syria, Palestine, Iraq, Afghanistan, Pakistan and other countries who are stranded here on the isle of Samos, in a hillside refugee camp. I can’t post photos of the camp for obvious reasons (would you want anyone to post photos of your home online without your consent?) – but I can tell you it’s crowded, hot and extremely basic. There can be shortages of water and electricity, families are surviving in small tents, living on rations and trying to make sense of an asylum system that seems designed to bamboozle them. They are tired, bored often frustrated. Most of all there’s a drought of hope. My work is simple: I join the team at the camp gates in the morning, we carry/ drag bags of donated clothes to the volunteer ‘cabin’ and unpack them in various plastic crates according to who the items are for (girl child age 8-12, short sleeves etc.). We work as a team with volunteers from the camp, which also makes translations easier. When we’ve organised ourselves, refugees come into the cabin to receive new clothes from the donations. Most are in families, some are alone, and some have just arrived on the island and have nothing. No clothes, money nor possessions. I can’t imagine standing in front of a table with a total stranger on the other side, being asked to choose articles of clothing for myself and my kids, including underwear. We make it as easy as we can: the kids get toys, we offer people drinking water, treat them with respect and dignity and try to ensure they get clothes that fit and make them more comfortable. 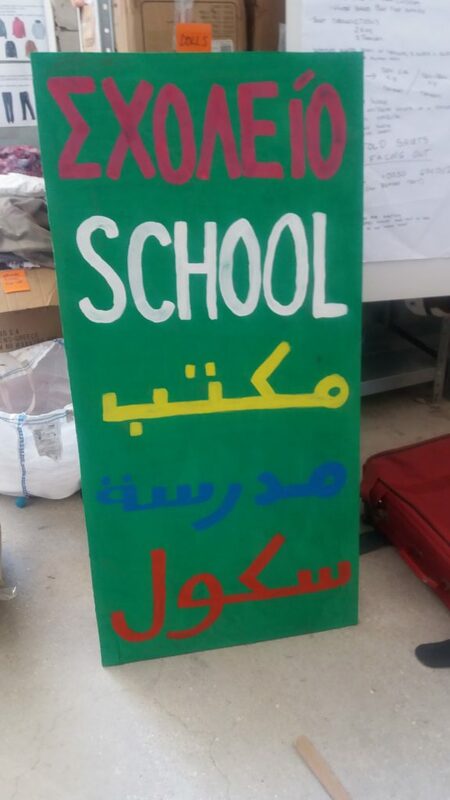 We also do activities with the kids, adult education classes and have just opened a small camp library with books in Arabic, Urdu, Pashtun, plus Greek and English books. Sure, it’s a drop in the ocean, but it is a drop. Camps of refugees are languishing across the Greek isles, some with no support at all. There are some tensions between local and refugee communities, partly because Greece has its own dire economic problems, and partly, according to some local people I’ve spoken to, because tourists don’t want to visit islands with refugee camps. On the isle of Leros, local authorities have been accused of stoking tensions. International volunteers based there report they had to flee threats of violence from the enraged local Greek community, leaving refugees guarded by the Greek military, like prisoners. There are other Greek families and communities who still host refugees in their homes, and who’ve been at the heart of the local response to save their lives at sea, supporting them before any international volunteers arrived on the scene. Residents of the isles of Kos, Samos, Lesbos, Chios, Rodes and Leros have being put forward for a communal Nobel Prize nomination. The refugee crisis and its dynamics on these Greek isles is a complex issue that defies any easy explanations or answers. I think Samos Volunteers is a decent initiative because it focuses on supporting refugees to be self-sufficient: this is not an ‘experience’ for refugee tourists – we’ve openly discussed this – it is a volunteer scheme for individuals who want to spend time supporting refugees and have skills to contribute. I distribute clothes, update the website (I’m in the nerd team), do other admin tasks and sometimes support the community teachers, who are from the camp. I speak Arabic, am fully aware that I’m also here because I want to feel good about myself and my own response to the refugee crisis, and believe my time here is useful. Refugee families do get some asylum information here, but need to travel to Athens for asylum assessments (which have to be carried out in the Capital). They can end up sleeping on the streets of Athens because they’ve nowhere to shelter, or wash whilst they wait to be ‘processed.’ This destitution is no new story, but shame on all of us that people fleeing bloody war are then forced to sleep in streets in a European capital, whilst struggling for refuge. Meet a family from Syria or Iraq living in a camp surrounded by razor wire, or a filthy street, and weep at what British and EU refugee policies force them to endure. I have to leave Samos at the end of next week: I’m not looking forward to saying goodbye. But for now and the coming days I’m here, and proud a sharply run volunteer initiative (we each pay all our own travel and daily expenses) can run rings round some of the great and grand ‘humanitarian agencies.’ Of course this blog is my personal opinion (it always is!). Please check out the Samos Volunteers website – and help us with donations of clothes, or cash, if you can. Right now we need men’s clothing – most of all trousers and T shirts in small and medium sizes, plus good quality underwear for men and women, old and young, big and small. They will go to a good home. Thanks a million from this beautiful speck in the Mediterranean where hundreds of refugees are stranded, hence the title, which is a quote from Gertrude Stein. Refugees and migrants need donations, hope and people like you! Keep on the good work.